From the time the Canadian Pacific Railway decided to build a spur line from Sudbury to Sault Ste. Marie in 1882 until the early 1980's when the round house was demolished, the railway was one of the town's main employers. 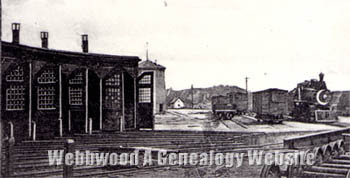 In 1886 Webbwood was named the divisional point between Sault Ste. Marie and North Bay. This move meant that a bunkhouse and round house were built and local men were hired to maintain the engines, cars and the rail lines themselves. railway roadmaster, railway section foreman, machinist, railway labourers, yardmen, train operator and telegraph operator. The highway between Sudbury and Sault Ste. Marie had yet to be built and the railway was the main source of transporting both people and goods. Over forty lives lost in C.P.R. Tragedy at Spanish River. (38 miles east of Sudbury, where the C.P.R. "Soo" line crosses the Spanish River, near Webbwood. )The dead - - Fred HOPPI-German; COSENGA, Italian immigrant, George E. McELHINNY, from Vanleek Hill, (fireman, C.P.R. ); Hiram JOHNSTON, Montreal fur-traveller; Father GARLAND; W.H. LAVERY, (fireman) from North Bay; Father BUSHEY; Father CHAILLOUX, Marist father of Montreal; Rev. Mr. CHILDERHOSE, from North Bay, Supt. of Presbyterian Missions for New Ontario. Five who died on the way to hospital, or in hospital, Sudbury are- - man, foreign immigrant, unknown, died on way; man foreign immigrant, unknown, died Jan. 22; J.HINEAULT, Matheson, Ont., died Jan. 22; Father CHAILLOU, Dorval, Que. ; Taroforf HOPPE; Mrs. C. HOUDGE, Sault Ste. Marie, Ont., drowned in diner; George McILHENNY, North Bay, C.P.R. fireman; Geo McLAUGHLIN, farmer, 22 years old from Acton Mills, Ont., died Jan. 22, in Sudbury Hosp. ; Nick NIKOLANKO, 150 Waverly St., Lawrence, Mass., died on way to hospital; John RESBACK, North Bay, C.P.R. fireman; S.G. SAUNDERS, Orillia, Ont., commercial traveller, drowned in diner, body taken to Sudbury; Zonnum SPINZIE, going to Chisholm, Minn., died in Sudbury Hospital, Jan. 22; T.H. Watt, Montana, formerly of Renfrew, drowned, body taken out of diner; unknown man, Italian or French; BOSENZA, foreigner; C. CAREY, Montreal; R.A. BOOTH, 13 Laurier Ave., Toronto; W.J. ROBERTSON, Arnprior, travelling Auditor of C.P.R. ; Patrick KINEHAN, Bruce Mines; E.F. BEMMELS, Lisbon, N. Dak. ; elderly woman, unidentified; a middle-aged woman, unidentified; Thomas AUSSANT, Blind River, Ont. ; unidentified boy, 12 yrs. old; Clara TEES, a four year old girl of North Bay, who was travelling with Mr. KINEHAN, her grandfather; Joseph KELLEY, Leavenworth, Washington Territory; George McDOUGALL, Copper Cliff; Mrs. STARK, Shawville, Que. ; Dr.McLELLAN, formerly of Westmeath, now of Blind River. WATT, a son of Mrs. James WATT, Renfrew. Killed in a railway accident at Webbwood. Aged 40 yrs. (Jan. 27)CHILDERHOSE - Jan. 21, Webbwood, Rev. Mr.